Product review: Martyn Davies – by Martyn Davies, 25 Sep 14 5/5 Excellent "Very easy, we rang the telephone number on the voucher and got through to the appropriate person. We then booked the date we wanted which was within a couple of weeks. The morning of the flight we rang again just to check it was still on as the weather was grim, we were told to ring back closer to the flight time and luckly the weather cleared up and was fantastic. There was a bar/club there which was located at 1st floor level so we had a brillant view. They also served food so we ended up staying after the flight and having Sunday lunch. We took the kids, they had fun watching the planes landing and taking off and also there was a grassed area where they could play and run around. The staff were very friendly and were full of information. We were very lucky as we'd only booked the 2 seater aircraft but when we arrived we took the 4 seater and we also allowed to take 1 passenger. Breifing was everything we needed to know. Fantastic would recommended to everyone, we took the whole family (10 of us) it was brilliant. After the event we took lots of photos then stayed at the club/bar for Sunday lunch, we were made to feel very welcome even though we hadn't booked and there was a load of us. The meal was very reasonable price. " Vale of Glamorgan CF62 3BD. The voucher will have Cardiff printed on it, but it can be used from.. Very easy to contact and arrange. We followed the directions provided and the venue was well signposted. Good facilities in the venue The staff were polite and helpful and very knowledgeable. The plane was in good condition. I was even able to pay a little extra for my partner to come up in the plane with me which was excellent The briefing was comprehensive and I felt confident about safety procedures and knew what was happening at each stage of the experience. My questions were answered well. I found the experience excellent, one of the best things I have ever done! 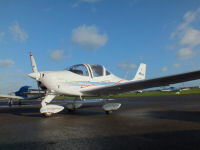 I would love to do it again and would highly recommend to a friend .I did take some photographs with the plane and spoke to the staff about possible flying lessons with them at a later date. The website was clear and accessible with helpful staff! Very easy, we rang the telephone number on the voucher and got through to the appropriate person. We then booked the date we wanted which was within a couple of weeks. The morning of the flight we rang again just to check it was still on as the weather was grim, we were told to ring back closer to the flight time and luckly the weather cleared up and was fantastic. There was a bar/club there which was located at 1st floor level so we had a brillant view. They also served food so we ended up staying after the flight and having Sunday lunch. We took the kids, they had fun watching the planes landing and taking off and also there was a grassed area where they could play and run around. The staff were very friendly and were full of information. We were very lucky as we'd only booked the 2 seater aircraft but when we arrived we took the 4 seater and we also allowed to take 1 passenger. Breifing was everything we needed to know. Fantastic would recommended to everyone, we took the whole family (10 of us) it was brilliant. After the event we took lots of photos then stayed at the club/bar for Sunday lunch, we were made to feel very welcome even though we hadn't booked and there was a load of us. The meal was very reasonable price. Easy to contact operator, had to re-arrange date - due to weather. Confirmed date - but pilot was half an hour late for flight - he was having his lunch! I live close to the airport, therefore, it was no problem reaching the airport. First time to see a small plane! Didn't receive a long briefing. Given a yellow waistcoat and walked to plane. Pilot forgot communications equipment. Experience was exciting! Flight time barely made 25-30 minutes. Given 'experience' as a Christmas present.